Boat trailer winches and winch supplies are designed to pull a boat, bike or other vehicle onto a trailer while minimizing manual effort. Choose from hand ratchet or electric winches, as well as trailer winch parts like cables, straps, handles, and hooks. Winches are for unloading and loading, not keeping an object on the trailer. Tips for inspecting your trailer's winch assembly: Visually check the strap, rope, or cable and hook before each use. Never use any strap, rope or cable that is worn, damaged, frayed or kinked. 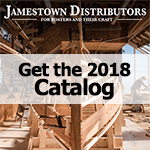 Replace any necessary parts from Jamestown Distributors. Make sure the winch strap is securely attached to the boats bow eye. Note: The winch or winch strap is not designed to be the only line securing a boat to a trailer while towing. Tie-down straps (bow eye and transom) must be used to properly secure your boat while towing. We carry hand operated ratchet winches in single and dual speeds, as well as easy to use electric winches to make launching and retrieving your boat simple. Replacement items such as winch hooks, cable, and handles are also available.